* As Deputy Minister booms: “If you're a satanic person injected with satanic ideas…” * DCE, party executives boycott NPP event A fatal accident involving a Mercedes Benz cargo vehicle last Saturday almost marred what eventually passed out be a successful congress to endorse the Deputy Minister of Tourism, Boniface Abubakar-Saddique as the NPP's aspiring member of Parliament for the Salaga constituency of the Northern region. The yam cargo vehicle with registration number GR 8439E was part of the Minister's convoy that had loaded party supporters from Makango en-route to the rally grounds in Salaga, the district capital of East Gonja. The accident occurred few kilometers after taking off from Makango, about 18kms to Salaga, when the car skidded over a small bump, falling on its right side. One major sore point was that when the accident victims were carried to the Salaga district hospital, the nurses were on strike. It took the diplomatic skills of some opinion leaders to convince the nurses to come out from their homes to attend to the injured persons. Eventually, one 18-year-old young man died from what one eyewitness termed “delayed treatment” by the hospital officials. However, thumps to Mrs. Elizabeth Owusu Sekyere, senior-nursing officer at FAME clinic at Makango, who for about five hours after the accident single handedly treated and discharged close to 30 injured people. But for her heroine exploits, the story would have been different. Meantime the townsfolk have blamed the cause of the accident on black magic (juju). They claim that it was an open secret that such an accident was going to occur to discourage people from supporting the event. The speculation was that elements within the party in the constituency vehemently opposed to the Minister's imposition allegedly hired three magicians to perpetrate the act. Sources in Salaga close to the deputy Minister told this reporter that following pre-knowledge of the accident, the owner of the cargo vehicle refused to drive the car and gave it to his mate, who also got injured. “But I believe the blood they have shed to the soil today will serve as the catalyst for victory in the coming elections both for myself and our great party”. Continuing he declared “My legacy is to see the development of Salaga for posterity”, stressing that he was no way in politics to amass wealth. He said he wants to emulate President Kufuor who even though has gone through a lot of some worse moments, has continued to fight to put Ghana on the world map. 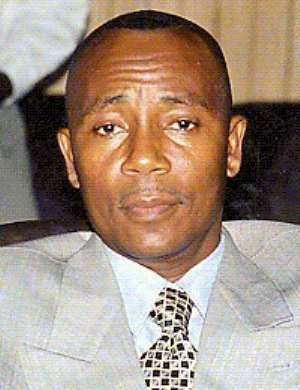 Not bothered by the boycott of party executives and the DCE, Mr Bismark Dari, who this reporter learnt preferred to attend a funeral instead, the charged Boniface boomed; “if you are a satanic person injected with satanic ideas, you either patch up or get out of Gonjaland because we are peaceful people”. Alhaji Fuseini Maiga, Leader of the Nasara Club, a Muslim wing of the NPP, asked the people to support the party's choice of the Independent MP to represent them in the coming elections. According to him, for almost 20 years, the National Democratic congress did nothing for Salaga and that it was the Deputy Minister who came to change the fortunes of the constituency within his short reign as MP. The party's Northern Regional Chairman, Alhaji COP Abdul Rahman, dammed the absence of the constituency executives, especially its chairman, Alhaji Sani Iddrisu, whom he accused of fanning problems in the party. He said politics is about numbers, stressing the NPP would always open its doors to anybody who will show commitment to help advance the party's fortunes.